The vast brown sea of thundering buffalo evaporated with westward settlement. An estimated forty million American bison were reduced to less than 500 by 1889.But thanks to ranchers, private groups and legislation, we celebrate over 350,000 bison in North America today! This revitalization now allows for the exciting sport hunting of trophy bulls that have been retired from breeding herds. 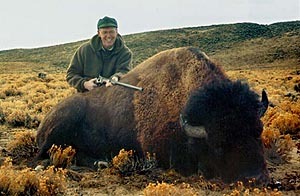 These hunts on acres of prime, native bison habitat in scenic Southern Colorado, Utah and New Mexico. You’ll likely encounter pronghorn antelope, wild horses and mule deer while hunting. If time allows, a visit to the Indian ruins is certainly worthwhile. Some hunts are on expansive, rugged terrain, our hunts are on horseback or utilize a four-wheel drive vehicle for locating your bull, with the final stalk being on foot. All hunts are fully guided with our experienced guides carrying a back-up rifle should an aggressive bull elect to charge. These massive Lords of the Prairie are amazingly quick and agile! When you combine their power with a fiery temper, they command every hunter’s respect, making for a majestic trophy and memorable hunt. TH Bison trophy bulls are not culls from our breeding herd. They are truly fine trophy bulls, each one selected for his size, cape, horn length and base diameter. All of our bulls have made the SCI Record Book! Some bulls will tip the scales around 2,000 pounds. Such qualifications are seldom found in young bulls, thus our bulls range from 2 to 6 years old. 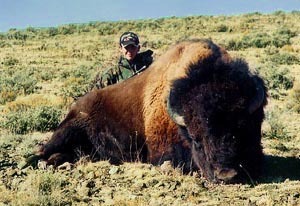 There are a limited number of trophy hunts available, so call to book your once-in-a-lifetime bison hunt today. I can’t wait to see the smoke from your rifle!